Please note that views expressed in these blogs are attributable to the authors and not the corporate body ATEUK. The Loyola campus perched on the edge of Lake Michigan was wonderfully placed for this congress. The lecture and training rooms were excellent as was the hospitality and food. As a swimmer I was aching to swim in the Lake at some point but that would come. The first workshop that I attended on the Monday morning delivered by Tommy Thompson settled all my nerves within about half an hour. His opening discussion was to ask us about our narrative, how we were feeling at that moment and if there was any anxiousness within us. He didn’t ask us about the anxiousness he just asked us to pair up and for one person to hold the other person’s hand and to give them unconditional support regarding their current emotional state for a couple of minutes. He said the fact that we didn’t know what they are anxious about did not matter, it was just to give them unconditional support, as an Alexander teacher would give any of their students. This simple initial work set the scene for two wonderful training workshops with Tommy and also for the week. Another comment that will stay with me from Tommy was that as an Alexander teacher we can give people an experience of their ‘potential’. The emphasis was on ‘their’ potential not the teachers. He added “we can give them no more and we should give them no less”. Another workshop was ‘Say Yes’ not ‘No’. Inhibition is ‘just a thought’ why not be a ‘yes’ thought. To stop, have the ‘thought’ and then say yes but in a positive uplifting light. Great speakers; from an actor talking about his own Alexander Technique lessons that we could all relate with, to a Buddhist priest talking about ‘Edge States’ regarding compassion. Chicago City Centre was great, I went up the Sears Tower; second tallest building in the world over 400m high. 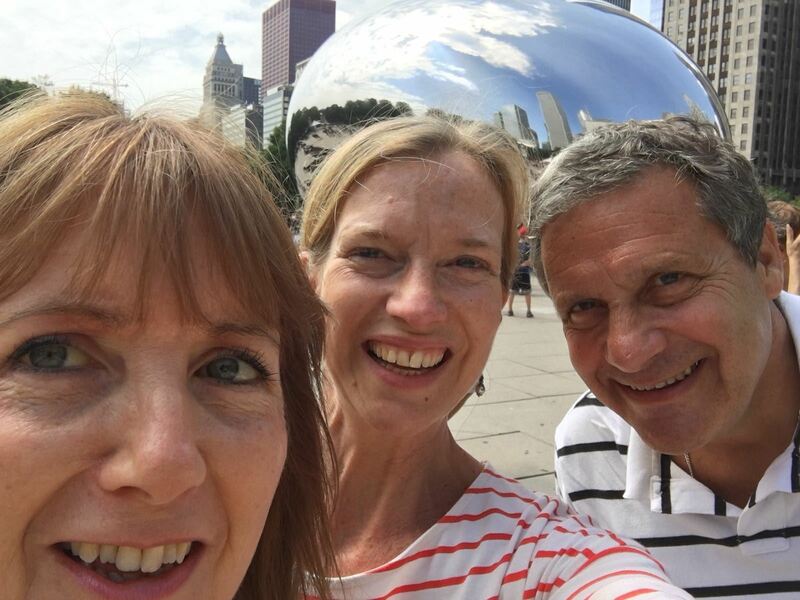 I went on a boat trip to see Chicago’s architecture and the skyline from Lake Michigan with over 100 other Congress attendees, a fantastic experience. Having lunch in the City with colleagues and getting lost whist trying to find a restaurant!!! I was the guide!!! Meeting authors of books I have read. Having a training session from Missy Vineyard on emotional feelings and wordage. Work exchange with teachers and receiving their guidance and support. Meeting people and making new friends from across the world. And yes swimming in Lake Michigan practising the Shaw method with a new friend from Finland. Having a beer in the college bar with another new friend from Washington. Meeting a fellow construction specialist from Chicago and discussing the differences between US and UK work culture debating on how the Technique could be a benefit. Work exchange on a lady from Chicago realising that this is for real. Dancing with a mob of Alexander Technique infused people on the last night, dance floor packed from virtually the initial song to the last. Listening to wonderful music from very special talented people. So what did the congress do for me? It was an uplifting week, full of generous and positive people and in the madness of current affairs it was ‘time out’ full of positive and upward thinking people. It has given me a new confidence in not only the Technique but how I fit within it. A wonderful week, if I could book for Berlin tomorrow I would. Just a thought. Thursday, 14th. June 2018, saw the EACAT, students, teachers and Director of training, make a summer pilgrimage to Reepham, Norfolk. 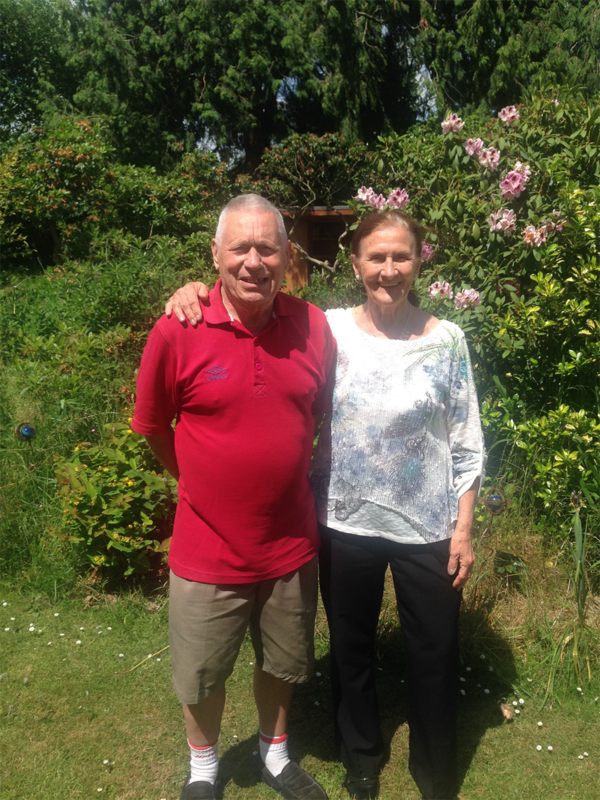 The trip was organised to visit the resident teachers, Ken and Angie Thompson, at their home, to immerse in a day of teaching, instruction, dialogue, and of course tea and cake. esting potted history of the village and their house, which is one of the original buildings within Reepham. Over tea, we discussed the outline of the day which was to include Ken and Angie giving 'turns' to the students and teachers, with opportunity to deepen our understanding of the technique. Angie worked with, half of the group, giving each student instruction, using both chair activity and table work. An important aspect of the work with her was a detailed discussion of the use and value of the position of mechanical advantage, 'monkey'. For students of the technique, this is a hugely important aspect of use, and can be very physically demanding for new trainees. had a great opportunity to observe, ask questions, or discuss aspects of the work as each of us had our 'turn'. The teachers in the group, also had an opportunity to give additional hands on work in the intervals between. Lunch saw copious quantities of tea, cake and more tea and more cake, being distributed between further discussion anecdotes and laughter. With the groups swapped, the afternoon session began Ken's group working with Angie, and vice versa. The chair work is of course, the opportunity to experience ones own habits in an activity, and to observe our reaction to stimulus. In that activity we have the opportunity to 'inhibit' and to subtly undo our usual, habitual, way of 'doing', getting out of a chair. This teaching was very ably demonstrated by Ken's 'non doing' hands. 'What he was doing with his feet and legs, was causing him to pull his head back' 'You've got to track down what is causing you to pull the head back' 'The neck is the primary control' But ,'the primary control is not a lever you pull, it is an indicator of what is happening'. Just as passport control, inspects and makes sure everything is OK, so 'Primary Control', indicates if all is OK. The day concluded by fond farewells. The dialogue continued into the next weeks at school and provided teachers and students alike with an ever greater understanding of this extraordinary work. Many Thanks to Ken and Angie for their kind hospitality and skilful hands. At ATE we receive training from many experienced teachers and today I met Wolfgang and learnt how to walk!!! My take on ‘Primary Control’ is trying to reboot the computer so we can start from neutral thus clearing out all existing data. Under Wolfgang’s direction after my attempt at Primary Control “Where is your weight” he inquired? Somewhat confused I didn’t know what to say, he then said “Your weight is in your thighs!!! A bean-bag on each shoulder as a stimulus; Wolfgang stated “Think through your heels and relax your jaw. Soften the chest and think about your weight through to your heels then back up to the crown of your head like a piece of elastic” This I had heard before but put more thought into my feet and felt grounded and lengthened whilst arms were suspended from my shoulders. Feeling balanced I asked Wolfgang about the spine lengthening whist walking. I explained I understood forward and up and let the neck be free and shoulders to widen and as a swimmer I could lengthen the back in the pool but could not see the direction whilst walking that would lengthen the spine. I was then lifted from behind onto my toes whist being suspended off balance forward to the point of falling. I was told “This is your first step and as you place your foot think bounce/spring forward and up with the length of elastic running though you to the crown of your head giving you spring towards the ceiling” With my neck free and head forward and up I could feel my spine lengthening as in the pool with the thought going through my feet then up to the space above my head. Whilst up on my toes it clicked in my mind that if I think up at the moment as my heel leaves the ground I could feel the spine lengthen. This bounce thought from the ground gave me an upward lift on each step. I could lengthen my spine on each step!!! At times I believe we need different input to gain understanding and the ‘physical lifting’ actually gave me the direction. Different teachers have their own methods and a combination of these have helped me gain an understanding. Thanks to all my teachers and fellow students at ATE I was ready to have that light-bulb moment with Wolfgang. I now work on myself whist walking every day. A number of students and teachers at EACAT wanted to attend Anne Batty’s “Working On Yourself” workshop in London in June but were unable to so imagine our delight when Anne agreed to come to our Chelmsford school to give the workshop here. Being in my final term of the AT teacher training course this workshop felt particularly pertinent. Soon I’ll be working largely on my own and awareness of my own use will be essential. On arrival, after brief introductions, Anne wasted no time in discussing the importance she places on working on herself as being a key feature of her working day. Closely studying her reflection each morning is the start to this work as soon as she wakes. With 50 years of Alexander Technique teaching experience the workshop was full of gems of interpretation of Alexanders findings. She explained that her work was continually evolving throughout her career and this being what keeps it so interesting. I loved her down to earth approach, an example of which is her dislike of the term semi supine or constructive rest as too pompous. ‘Lying down work’ being her preferred term. 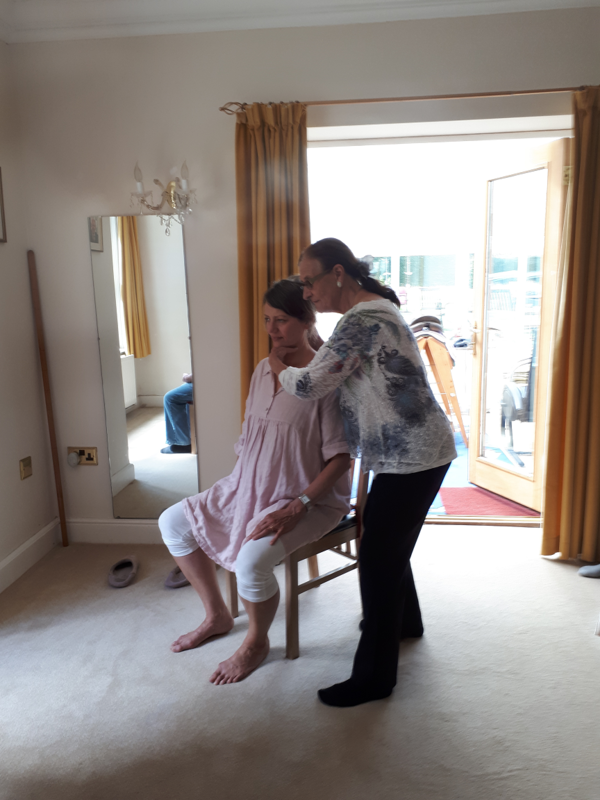 We spent the morning experimenting with chair work, table work and everyone was keen to see how Anne worked with people on the floor. I think Anne’s approach to wall work will be invaluable for me. We all felt we’d been put through our paces by the end of the workshop and had much to take away with us. Anne’s energy and vitality was as impressive as her work. She was disappointed we wanted to stop for coffee as she didn't want to waste time! Earlier that morning my neck – which had been on the verge of collapse for some days - finally popped. The nape of my neck and all of my right shoulder had gone into spasm. I couldn't turn fully to the right. Looking left was difficult as well. So it was just as well that later that day I was seeing Elaine. To the people of Leigh-on-Sea, Elaine is somewhat of an enigma, she pops up all over the place and can often be found taking a dip in the sea or having a nap along the breakers on the beach. Or at least that is where I most often will find her. Either that or wandering around London art galleries and theatres. At the bottom of her garden is a beautiful old schoolhouse – here she often holds small get-togethers during the summer months where musicians, writers and actors share their work. But by profession Elaine teaches the 'Alexander Technique'. To anyone overhearing this conversation it may have seemed strange. But I was desperate to be fixed of all the aches and pains so willingly accepted her offer. I didn't anticipate her coming up behind the counter whilst I was serving and placing her hands on my back then and there. However as soon as she did, making small corrections to my posture I instantly felt uplifted and calmer. That was when I knew I had to find more out about the Alexander Technique. A few days later I went to Elaine's house for my first lesson. The first thing she made me do was lie down on a large table with my hands resting on my hips, my knees bent with my head resting on a small pile of books. I soon realised that this would be how I would spend most of the sessions and was promptly told to think about sending my hips back and my knees forward. With emphasis being placed on the thinking not the doing! Although this seemed to defy the laws of biology I tried my hardest to do so. Elaine then moved around the table and made small adjustments to my posture, movement and breathing. The aim was and is to allow yourself to release the tension that is stopping you from achieving. In all honesty I hadn't a clue what she was saying or doing to me because Elaine invariably talks in riddles but whatever she was doing was working. Back to the present now. When I arrived at her house last week Elaine was deciding whether to go and 'dunk' herself in the sea. She took out a coin – heads she would, tails she wouldn't – tossed it in the air all the while saying “I want it to be tails, I want it to be tails” which it was. Whilst I don't believe there could be some divine interception at work, it is these little foibles that make me love Elaine all the more. This is often the shape of conversational patter with Elaine. In the same exchanges you are faced with jaw-slapping one liners then instantly the topic changes to discuss her latest expedition into London's cultural scene, only just as quickly to go back to talk about how she can feel your body move. The flickering of each muscle that to oneself is invisible but to her speaks volumes. Elaine certainly has a knack for connecting the physical and emotional during her sessions. It's not something that I believe has developed over our becoming close. She is extremely intuitive and from day one knew me without me uttering even a syllable. She seemed to know the essence of what was on my mind. Though perhaps that is because I am perpetually easy to read. After this brief episode of hysteria passed Elaine covered me in a blanket for warmth and left the room to prepare some soup for her husband, John. Once fifteen minutes had gone by she came back. No matter what she does she knows how to make people laugh, me included. But this time she looked at me, walked to the table to help me up with the customary hug that comes at the end of each lesson. Despite my laughter and my smile, as she moved me from laying to standing she said something that hit my core, “I can tell that you're still rather sad though aren't you? I won't ask what it is but whatever it is, don't worry. It will pass.”And with that my neck clicked free. 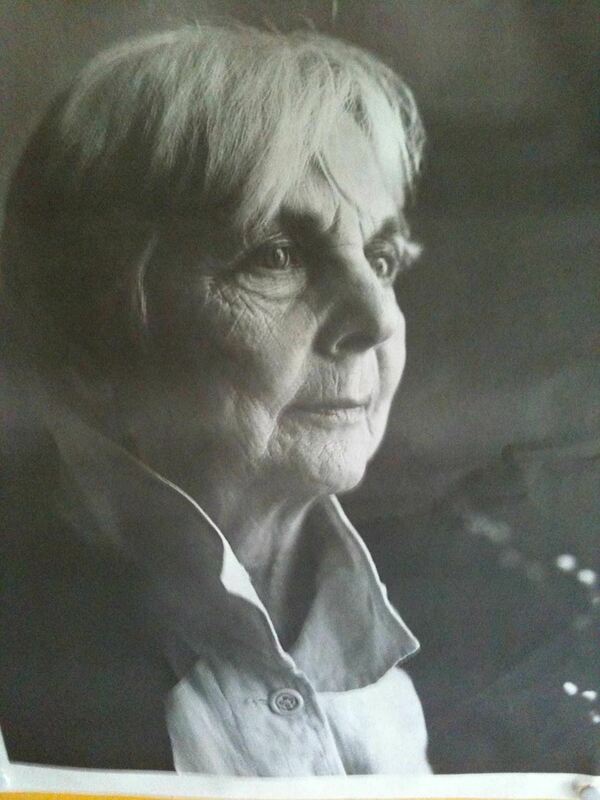 Footnote: Sadly Elaine passed away in October 2014. She loved, laughed and lived 'til the very end. We'll miss her but will continue to celebrate her life whenever we think of her! Elisa Adams is writer and jazz singer from Leigh-on-Sea. Since Elaine passed away Elisa ran the London Marathon as part of Team Fair Havens to raise money for the hospice where Elaine spent her final days. This article was originally published in Trawler magazine in June 2015. Summer is now drawing to a close and holidays are over but before it’s back to ‘business as usual’ I would like to share an account of the 10th International Alexander Congress which took place in the beautiful town of Limerick on what must be one of the most striking university campuses in the world. Set on the banks of the river Shannon, the two University villages are linked by the Living bridge, named for its architectural design which creates movement as people cross it. The two villages of student accommodation are surrounded by magnificent halls of learning and impressive architecture. With numerous restaurants and cafés to choose from. The student life here must be very conducive to study and social activities. What a fantastic venue then for our Alexander Congress. This was the best attendance ever with 700 delegates from 40 countries. The opening ceremony was hosted by the organisers Richard Brennan, Niall Kelly and Glenna Batson and we were hugely entertained by Michael Gelb’s witty and informative session on Leonardo DaVinci, a genius visionary whom Michael compared to our own FM. This set the bar high for the whole week and we were not disappointed! From the plenary sessions to the talks, from workshops to work exchange there was infinite choice to satisfy every interest. Swimming, running, singing, movement, music, anatomy, eyesight, to mention just a few. We were also treated to Irish music, Irish dancing with such talented children enchanting us with lightning footwork and straight backs, a Limerick competition with a huge range of subject matter and totally crazy judging. There was a chance to learn some dancing, to meet many authors of AT books and to view new film footage. Heads of Training had a special lunch with over 30 in attendance and the week was rounded off with a magnificent Gala dinner in a local hotel with a three course meal and music provided by a local band. The band members were overwhelmed to see so many people up on the dance floor, they were taking pictures of the dancers !! That’s the Alexander world for you, people moving freely and having such fun. Our organisation was very well represented with our brochures on display in the main building. Our participating members wore the ATE UK badges from day one which we think inspired ATI to wear theirs too. It was also a very great pleasure to meet up with our colleagues from Australia (ATE inc) and to exchange news and views. There is now a newly formed ATE Espania. Ken Thompson, our most senior member was at the heart of the event very busy with helping to film the whole Congress. The closing ceremony was very inspiring, again Michael Gelb did a splendid job, Michael Frederick, the founder of the International Congresses was delighted to announce that in 2018 the next Congress will be held in the USA in Chicago. The whole event was rounded off with some beautiful singing and a trio of Alexander teacher/musicians playing a selection of classical music. The above account cannot fully capture what a marvellous experience it was to be in Limerick and to be part of such a large representation of our worldwide Alexander community, the spirit of sharing, the kindness, the fun and laughter and, of course, the opportunity to pool so much knowledge of our work for the future development of FM Alexander’s Technique. I am certain that he would be highly delighted with the shape of things to come. On 5th May a group of running enthusiasts and a number of less enthusiastic participants (! ), attended this running workshop based on Alexander Technique principles. By the end of the day, I think it’s fair to say we were all more pumped about running than we started out! Malcolm’s easy style and simple explanations made for a relaxed learning environment where everyone was enjoying having a go. Malcolm lead us outside to a wide lawn area where we did some easy warm-ups. After these typical warm ups, we did a series of exercises to prepare us for a more efficient running style. First, we did bouncing up and down on the spot trying to connect with the elastic nature of muscles, rather than pushing with great effort to go up - a real feeling of economy of movement. Then, still staying on the spot, and allowing both feet to the ground, first 3 times on right foot, 3 times on left foot. Then 2 times on right foot, 2 times on left foot, and finally once on right foot, once on left foot. Hey presto - now we only needed the forward momentum! Malcolm showed us how to just lean very slightly forward from the ankles and imagine the heel coming up under the thigh. Off we went. Running suddenly seemed much easier! He used a long band around the runner’s hips to demonstrate how to lean into the run from the ankles. We then did this in pairs, with one partner keeping a strong grip of the band and then running a few steps with you. Then the partner lets go of the band and off you go! We experimented with starting off running by leaning slightly forward from the ankle but then when you have reached your desired running speed, straightening up. Malcolm paid attention to arms, saying they needed to be drawn back in order for them to spring forward each time. He got us to swing the arm in straight position so you could feel the pendulum was the shoulder joint. Then he explained why the arm needed to be bent at 45 degrees to shorten the lever. Malcolm uses Alexander’s Primary Directions over and over while he runs. We tried it and again, great advice, it did seem to help keep the directions going while running with more freedom. Neck to be free, Head forward and up, Back to lengthen, Back to widen, Knees to go forward and away! Boot camp was complete!! The round up at the end of the day, using before and after video footage of each runner, is a classic Malcolm technique and really helps each runner make sense of his/her individual changes over the course of the day – and gives everyone inspiration to see how much can be achieved. Having done 4 of these over the years, I am amazed at how much I learn each time. I can really recommend this running workshop to all – especially if you don’t like running – you may find you actually really enjoy it once it becomes so much easier! My abiding memory of the two days I spent at Wolfgang's workshop is the way I felt as I drove home - the most fully embodied and alive I have felt for a long time. Great as it is, that sort of intense feeling can't last so what else did I take from the event? The session where we took turns to lie down and be worked on by 5 others - one taking the head and one on each limb - was a powerful reminder of what it takes to force us to let go of our urge to control. You just can't stay in charge with that sort of energy around you. Moving in threes while playing with the roles of who leads and follows further uncovered our deep-seated control-freakery. By later in the second day the wonderful peacock feathers had us twirling under their spell, experimenting with the balletic freedom of movement that came from letting go and following the extravagant, elegant plume balanced on our hand. It really is possible to think up through a feather! But what did I learn as a teacher? That even teaching AT it is scarily possible to get into habits. We watch someone walk or sit and know what we are looking for, and probably how we think we can best help them realise the habits they have. All too often, as we did in the lead/follow exercise, we work from a point of control and can't see our own habits in the process. 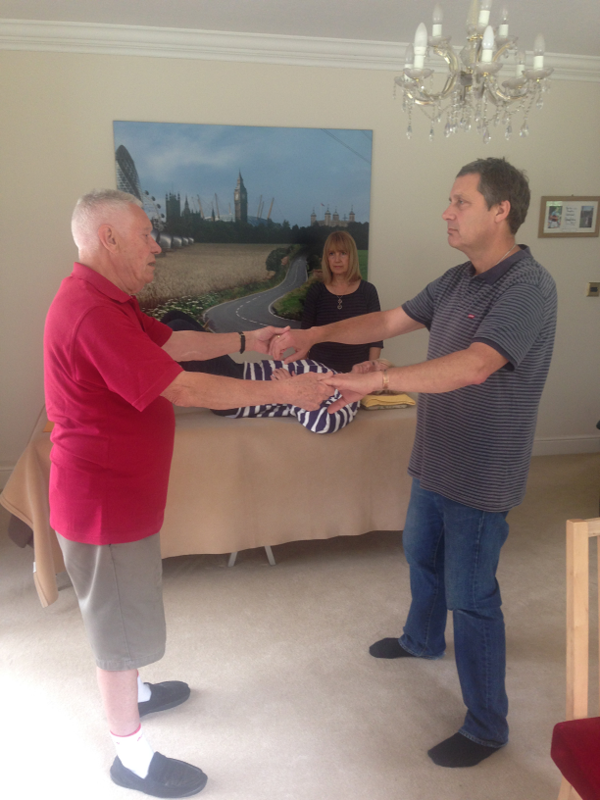 What Wolfgang brought to the fore was the possibility of moving with someone - not controlling but sharing the movement - and in the process sensing how they move, what their mind and body is doing and where the tensions are, whilst hopefully sharing a living example of release in movement. There were some activities we did that I might be wary of using with some pupils - an elderly arthritic new pupil may be put off by being asked to trust me to tip them backwards and forwards, but a lot of the principles could be adapted to suit a variety of people and situations. Foremost though it reinforced the privilege we have in sharing the beauty of use - mind and body working as a harmonious whole. At the end of June EACAT was privileged to host a workshop by the renowned Israeli Alexander Technique teacher Avi Granit. Avi studied with Patrick Macdonald in London in the 1980s, completing an extra year after qualifying to further enrich his learning. He has a busy practice in Israel, but makes time to visit the UK to present workshops and give individual lessons. This was the first time he had ever been to Essex and he was accompanied by Jill Payne, an Alexander Teacher from Kent, who has worked extensively with him on his previous visits to England. Avi’s audience spanned a wide range of experience, from students in their first year of training to Alexander Teachers of long standing. From the introductions onwards, everyone was equally attentive and involved. Avi has a dynamic teaching style, constantly questioning whether Directions are being given, and if so, whether they are the most appropriate to the situation. His theme for the morning was ‘ Opposition ‘ and he first gave us a Master Class, using willing volunteers , to show us the concept in action. After this, he allowed time for us all to practice what we had been observing, and he and Jill circulated to give advice and Direction. I made brief notes during the morning, but as always with AT you really had to be there! 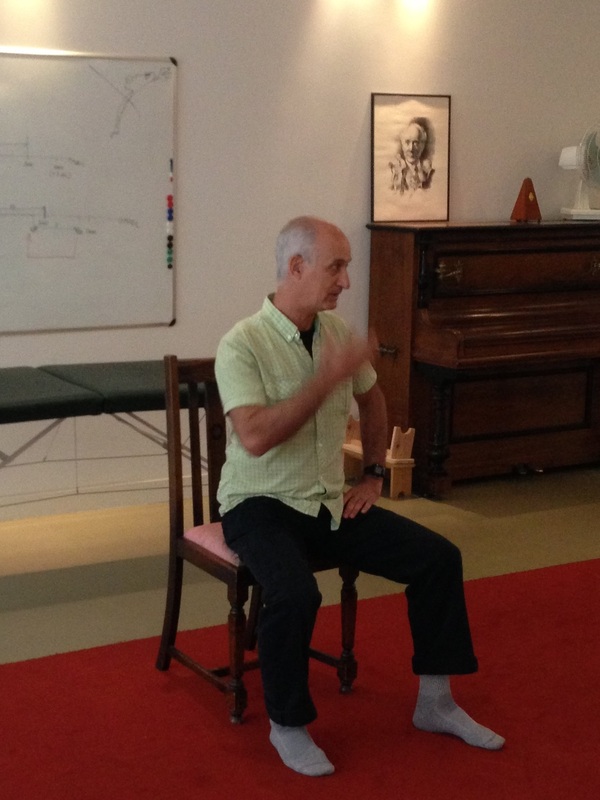 As he brought a pupil out of a chair, Avi talked about the vital importance of the primary control, and the space that giving the ‘Neck free, head forward and up‘ Direction creates between the head and the body. He reminded us to consider all three dimensions of the body – not just length but width and depth too. Referring to his concept of ‘the three ups’ ( the up of the head, the up of the back and the up of anti-gravity ) he gave us a memorable analogy for the third ‘up’ as being like the bubbles in a bottle of fizzy water. Unscrewing the cap is like freeing the atlanto-occipital joint, allowing the bubbles to rise. Whichever way you tip the bottle the bubbles will continue to rise upwards. Avi explained that thinking of parts of the body in opposition to each other was to him a more powerful Direction than simply thinking of them releasing away from each other. To demonstrate this he used hands on the back of a chair and introduced the idea of a hexagonal shape composed of the shoulder girdle as one side, the upper arms as two more, the lower arms and the space between the hands as the final three. By thinking of different sides of the hexagon in opposition to each other we were able to widen and lengthen much more than expected, especially with a partner putting hands on the arms and giving the same Direction. Avi told us that he usually practices this for about fifteen minutes a day and finds it to be endlessly useful to his own development. Time just disappeared, and, before anyone was ready, we had reached the end of the morning. Avi finished with his mantra, which translated as ‘ Aim up, stay back in all circumstances’ . During the afternoon, Avi gave individual lessons to some of the teachers and students and again they found his teaching fascinating and dynamic. For the rest of term the students at the school experimented with and discussed Avi’s ideas and everyone felt they had gained something valuable to add to their practice of AT. Avi hopes to visit the school again next year and I think we would all value the chance to meet this inspirational teacher again. Ethan Kind, M.M., certified A.C.A.T., Am.S.A.T. To prevent injury and strain in playing, lead yourself through this guided release of your body before you practice or perform. First, find a comfortable, firm surface to lie on, which might be a yoga pad or carpeted floor. If you have to do these releases on a hard surface, you may still be able to let go of enough tension to feel comfortable. Lie down on your back with your knees up. Your feet should be placed close enough to your hips, and far enough away from each other, to allow your legs to balance themselves, with knees pointing straight up. Place a book under your head so that the forehead and a free jaw are level with each other. Rest your hands on your lower ribs or abdomen -whichever feels more comfortable to you. Let your elbows be fully away from your sides and resting on the floor, your hands not resting on top of each other. This is the 'constructive rest position. It is the most neutral body position for the bones and muscles; it is essentially perfect sitting, lying on your back. In the Alexander Technique, this awareness exercise is usually done with the eyes open, but I also find it helpful to do it with the eyes closed, so that you can be in the world but not of it, as you release deep tensions that you do not want to take to the instrument. Let your neck release and your head be fully supported by the book. Let your shoulder blades fall to the floor; do not immobilize them against the back. Let your hips be fully supported by the floor. Let your feet be supported by the floor, with your ankles totally released. Let your feet be totally released; be aware that they're not supporting any significant weight. Think of your knees releasing to the ceiling, as if strings were gently supporting each leg. Let your calves release to your heels. Let your thigh muscles flow to your knees. Let your hamstrings release to the back of your knees. Let your whole back be supported by the floor but do not try to flatten your back – just let the curves soften as it releases deeper and deeper into the floor. Let the floor support your elbows; this allows the floor to support your arms. Let your hands be soft and rest on your torso and let your wrists be unlocked. Let the chest muscles release and the shoulders fall fully open into the floor. Let the muscles around your eyes and mouth release, allowing your face to soften. Let your jaw release, your teeth not touching, your lips touching gently. Let your upper arms flow to your elbows. Let your lower arms flow into your hands. Let your neck release and your head move away from your sit bones. Let your shoulders flow away from each other. Now let your upper arms flow towards your shoulders. Let your forearms flow through open wrists into soft hands, with the fingers leading the arms into lengthening. Let your upper legs release out of the pelvis. Let your lower legs release away from the knees. Feel how far the head is from the shoulders. Feel how far the head is from the hips. Feel how far the head is from the knees. Feel how far the head is from the feet. Feel how effortless it is to sense your body, as you let your head be far away from all of these places. Notice the rise and fall of the chest on the breath. Do not control your breathing; let the body breathe itself. Let the exhale be a letting go, not a pushing out of the breath. Let the body decide when it needs to inhale, and when it needs to exhale. Feel the rise and fall of the chest on the inhale and exhale. Feel the rise and fall of the abdomen on the breath. Feel the expansion and release of the sides of the chest on the breath. Feel the expansion and release of the lower ribs on the breath. Feel the expansion and release of the sides of the abdomen on the breath. Feel the upper back go backwards into the floor on the breath. Feel the mid-back go backwards into the floor on the breath. Feel the lower back go backwards into the floor on the breath. Feel the rise and fall of the shoulders on the breath. Be aware that the pelvic floor goes downward on the breath. Feel the hands and forearms rise on the inhale and lower on the exhale as the upper arms rotate gently in the shoulder sockets. Feel the whole torso expanding in all directions on the inhale, like a balloon being blown up. As you observe your breath, notice that it settles into a peaceful, rhythmic breathing pattern. Open your eyes if they are closed, and let yourself come into the room. Feel yourself fully present in the room without interfering with the ease in your body or the ease in your breathing. When you are ready, gently role over onto your side and slowly push yourself up with an easy arm. You can now take all of this ease into warming up on your instrument. As you warm up, stay with what is happening in your body – what you are asking it to do or not to do – and as you play your instrument, remain totally in the present. Gradually allow your energy to rise. Experience the joy of coming to your instrument without habits, tensions or fears that would turn doing what you love into a chore. Anonymous. A Course in Miracles. Bonpensiere, Luigi. New Pathways to Piano Technique. Diamond, Dr. John. The Life Energy in Music, Volumes 1-3. Ethan Kind, formerly Charles Stein, trained as an Alexander Technique teacher at the American Center for the Alexander Technique in New York and has been teaching since 1992. He also has a M.M. degree in classical guitar and was a concert guitarist for ten years. He has also been an athlete all of his life. Mr. Kind’s writing (as Charles Stein and Ethan Kind) has been published in the United States, Great Britain and Australia. Mr. Kind lives in Albuquerque, NM, and can be reached at www.ethankind.com. Mr. Kind has 64 ebooks for musicians and other topics, from running to yoga, offered in a Kindle version on Amazon. To find out more click here. For a pdf version, visit his website at www.ethankind.com.